This site has crossed my radar a few times recently, and I finally got back to it with some time to look at what all is available there. The first thing I had been looking for was propagation information for VHF, particularly 6 meters. Looking deeper, I find real-time DX contact spotting on auto-refreshing maps. This really is a lot of information on one map ..!.. 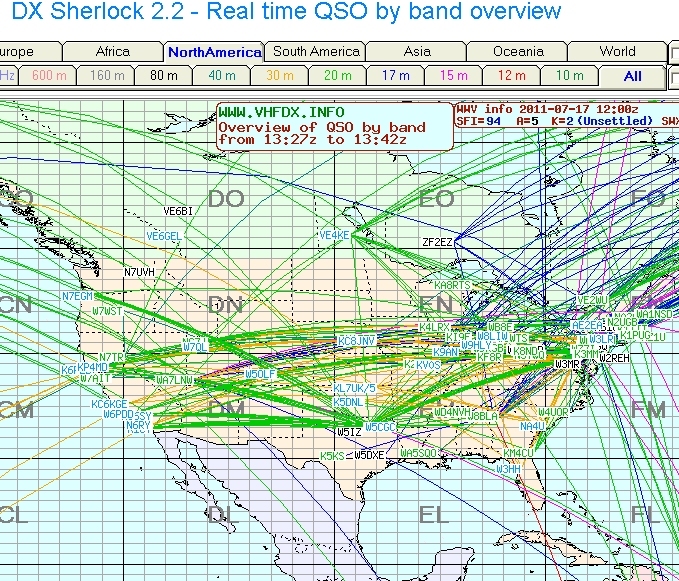 Looking at each band individually helps understand what frequencies are working and to where. I also found real-time MUF maps that show Sporadic E-skip ‘hot-spots’. WoW ! Go check out the North America 6m map on http://www.vhfdx.info – I registered with the site so that I can submit contacts and contribute to the data collection. Makes another good example of crowd-sourced science. I’ll be using this more . . . Thanks Gabriel (EA6VQ) – this is a wonderful site. Well done sir .!. I did catch one good contact Sunday evening tho; about 0150Z I worked Clayton – W4KVW in EM80, just west of Jacksonville, Florida. That distance is ~406 miles. I always like to point out that I’m only running 30 watts, with an omni-directional antenna in the attic. Shortly after that I heard Jimmy – W4ZRZ working Drew – KO4MA (also in Florida), but I couldn’t hear Drew… Maybe we’ll have some more good conditions like this before the winter cold settles in. These big cold fronts really spice up the bands. Good VHF conditions for southeast US this weekend. We all know that the only radio contesting I ever participate in is the VHF contests… and even then it is only to see if I can beat my previous score. It certainly is not to impress my wife. With ‘in-attic‘ antennas I’m about the only one I can beat. I’m actually pretty pleased with these antennas tho, because I don’t have to twist a rotator back and forth, and I can work just about anyone that I can hear. Sometimes I hear things the other guys don’t, cause they are pointed off to the side or something. Often omni-directional antennas get a bad rap, but they do have their advantages. I had some preamps on there last year, but then I could hear folks that can’t hear me. I do rely on other folks that have big antennas on tall towers with serious power for my DX. Still tho I really enjoy having so many stations on for a good weekend of VHF. Again this contest, we had a local ARES Simplex Exercise Saturday afternoon, to bring out a few more operators, and introduce them to the world of VHF without repeaters. Pretty good participation ! I don’t have a lot of space in my shack, and share the desk with my computer stuff.